You can banish 2 “Six Samurai” monsters from your GY and/or face-up from your field, then target 1 “Six Samurai” monster in your GY, except “Secret Six Samurai – Hatsume”; Special Summon it. You can only use this effect of “Secret Six Samurai – Hatsume” once per turn. If exactly 1 “Six Samurai” monster you control (and no other cards) would be destroyed by card effect, you can banish this card from your GY instead. Secret Six Samurai – Hatsume is one of the only “Secret Six Samurai” cards I like. Good stats, inherited Special Summon for the cost of banishing 2 Six Samurai monsters in your grave (you’ll have plenty), and her Level 3 and 1600 make her sync well with the cards typically run in a Six Samurai build. Kageki and her will give you a Rank 3 or Link 2 straight away, Aestheticism of the Six Samurai alongside Hand or Mizuho will pull her from the deck, offering you the same options Kageki did, she’s searched by the before-mentioned Aestheticism, as well as RoTA and Shien Smoke Signal, and can’t forget Gateway. 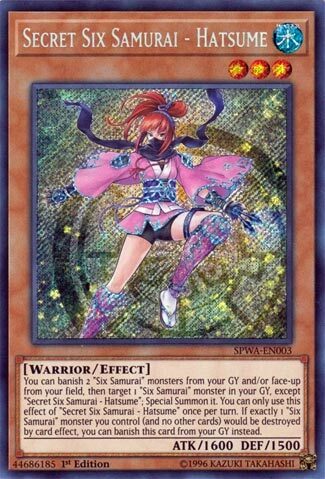 Her banish to Special Summon effect can be easily balanced out with multiple copies of the Six Samurai monsters you run. Most builds will run 3 Kageki and 3 Kizan, no matter the style you are running. In my personal build I ran several copies of each, as well as the “Red and Blue Style” with 2 Mizuho and 1 Shinai. This card works really well with the archetype, not needing any other “Secret Six Samurai” monsters to be good. She inherits the banish to protect one Six Samurai from destruction effect all “Secret Six Samurai” monsters have, only adding to her playability within the archetype. If you run Six Samurai, but aren’t crazy about adding too much to the deck, she’s worth considering, especially if you can use the tricks I previously mentioned. Happy Friday! Today’s card is Secret Six Samurai – Hatsume, a Level 3 Water Warrior-type monster with 1600 Atk and 1500 Def. The stats are good and make her very searchable with Six Samurai cards and ROTA. You can banish 2 Six Samurai from your grave to Special Summon a Six Samurai from your grave. Don’t banish from the field because that would be bad, but the option is there as well. Then she has the standard grave protection effect for one Six Samurai. Hatsume is fun. She can be what you search for or a revival piece to extend plays or both at the same time. The effect is only once per turn, but multiples of her should be considered because of the multiple Six Samurai run in the deck making the cost negligible. The final Secret Six Samurai we look at this week, and being the only other good one, we have Secret Six Samurai – Hatsume. Hatsume is a Level 3 Water Warrior with 1600 ATK and 1500 DEF. The stats are fine for a Level 3. The type and level give you Smoke Signal and ROTA to search this gal. Water has some support, but I should just say you don’t really use attribute specific support in Six Samurais. Hatsume while on the field lets you banish 2 Six Samurai monsters from the field or GY to revive a Six Sam from the GY. You are most likely banishing from the GY, the field is so suboptimal. With this, you can get more names on the field or revive one of the Level 2 Tuners to go into Shi En, or the Level 1 Tuner in Fuma if you already have a Level 4. Hatsume also has the Secret Six Clause, like all of the other Secret Six Samurais. Overall, this is a nice play extender for Six Samurais, though banishing from the GY isn’t what Six Samurais as a whole focus on, and there isn’t no real good Six Sam card to work with the banished Six Sams. Still a good card for them.